Our Casbon Journey – A blog dedicated to family history, stories, and important events pertaining to Casbon and closely related surnames. My universe was shaken earlier this week when I learned that Michael “Mike” Casbon had passed away suddenly and without warning on Sunday morning, 17 March. He was fifty-three years young, and lived in Hebron, Porter County, Indiana. I’ve been corresponding with Mike’s father, Ron for a number of years because of our common interest in Casbon family history. Ron introduced me to Mike, who was also interested in genealogy, via email in 2016. Mike and Ron both come from the “James/Amos” branch of the family, while I come from the “Thomas” branch. Thomas and James were brothers who migrated to the U.S. and settled in Porter County. Mike and I have shared a lot of information about our respective families. Mike started the Casbon Family Facebook group in 2008. This has grown to more than 140 members, and has become a place to swap stories, photos, and news. The group was also the place to learn about upcoming reunions, which Mike hosted at his home every couple of years. It was at the most recent reunion, in August 2017, that I finally met Mike face-to-face. I believe this was the first (at least since the early twentieth century) reunion attended by members of both the “Thomas” and “James/Amos” branches of the family. Mike invited my father and me into his home to share a meal the day before the reunion. We were able to chat and get better acquainted. It was immediately obvious that he was a loving father, husband and grandfather. The house was filled with his children and young grandchildren. He took pride in his family. They were clearly the center of his world. The entire family made us feel welcome and we enjoyed our brief stay there. [Mike} is a Subject Matter Expert for the OSHA Training Institute and specializes in the field of demolition, decontamination, and construction. He has trained over 1,000 Compliance Officers on field inspection principals. Mike has served on the National Demolition Association Safety Committee for 20 years, six as Chairman, and led the most recent rewrite of the Association’s Safety Manual. He has extensive experience in project managing large scale facility decommissioning projects, brownfield remediation, CERCLA and Superfund projects, and selective demolition. This weekend, Mike was going to be inducted into the inaugural class of the NDA Hall of Fame at the association’s annual convention in Denver, Colorado. He was to be honored “for his efforts to lead and significantly contribute to our Foundations of Demolition Certificate Program, his work on our Safety Manual, and his expertise on Safety on the jobsite.” He would have received the award at the annual banquet on Monday night. Sadly, the award will now be given posthumously. I will miss him as a friend, family member, and fellow genealogist. Mike’s obituary is posted on Legacy.com. Please keep his family: Anne, Kiera, Kylee, Kate, Kristen, Alexianna, Simeon, Grayson, Ron, Becky, Amy and Matthew in your thoughts and prayers. “Decommissioning, Decontamination & Demolition,” ERM (https://www.erm.com/en/service/all-services/decommissioning-decontamination-demolition/ : accessed 21 March 2019). “Course Instructors,” National Demolition Association (https://www.demolitionassociation.com/courseinstructors : accessed 21 March 2019). email, Natalie DeHart to Matthew Casbon, 20 Mar 2019; supplied by Ron Casbon. Today’s post is the result of a mostly pointless, but possibly interesting exercise. I decided to see how many first names there are with two or more occurrences in my database of people with Casban, Casben, or Casbon surnames. Then I decided to list the earliest and latest instances of each name. Did you make the list? Great—that means you’re in good company! Didn’t make the list? Even better—you’re one of a kind! I suppose it says a little bit about how names come and go in fashion. Some have withstood the test of time, others were only popular for a short period. Some have declined and others have made revivals in recent years. Our names are a unique element of our identities. They outlast our bodies and remain in the memories of others. They provide something for family historians to grab onto in their quest to revive the past. Each one is a potential story waiting to be told. Do you have any favorite names or stories to go with them? I often don’t know what I’m going to write about next. Such was the case when I finished last week’s post. I keep a spreadsheet of potential topics but don’t follow it in any particular order. Today’s post came from a totally unexpected direction. Someone had posted a link on Facebook to a search page on the United Kingdom’s National Archives website. I have visited this website many times in the past with occasional success. The description of the Casbon record indicated that the convict had been tried in 1821 and was a prisoner on the Hulk Leviathan. The petitioner was one P. Leyburn of Meldreth, Cambridgeshire. This immediately got my attention. It seemed to refer to the case of Thomas Casbon, or Casborn, who had been convicted of stealing a silver watch and sentenced to seven years’ transportation. I wrote about this last October, suggesting that the convict was probably my third great-grandfather. Maybe this new record would be the proof I was looking for! The National Archives description also said that the record is available for download from Findmypast. That is where I had found the records about Thomas Casborn, the subject of the earlier post. I was surprised because I thought I had seen all the pertinent records on Findmypast. I don’t have a paid subscription to Findmypast, but free access is available at my local Family History Center (FHC), AKA the local Church of Jesus Christ of Latter-day Saints. The FHC near me has excellent facilities, with about a dozen computer terminals, and access to many subscription websites. I popped into the FHC and opened the Findmypast website. My initial search didn’t turn up anything new, so I decided to look at the website’s card catalog. All the previous records concerning Thomas Casborn had been in a collection titled “England & Wales, Crime, Prisons & Punishment, 1770–1935.” When I looked in the card catalog I discovered another database called “England & Wales, Crime, Prisons & Punishment Browse, 1770–1935.” The titles are the same except for the word “Browse” in the second database. They are clearly different collections because the former contains 5,762,300 records and the latter has 1,823,668 records. The word “Browse” told me that the collection was not indexed, i.e., you can’t find individual records through the search page. You have to literally browse through all the images to find one you are looking for. I didn’t fancy browsing through 1,823,668 records to find a needle in a haystack. Fortunately, the National Archives catalog contained more information to help me narrow things down. The record I was looking for is contained in record series HO17, piece 92. After some experimentation, I found that I could narrow my search using those identifiers. This narrowed the number of records down to 1,049. Once I started browsing, I learned that the individual petitions were organized into “bundles,” each with an alphanumeric reference. The Casbon record I was looking for had the reference “Rk4.” After a bit of trial and error, I found what I was looking for. The record consists of only two pages, probably front and back of the same page. One side was addressed like an envelope “To Mr. Capper @ the Secretary of States office for the Home Department, London.” The other side contained the body of the letter. Although the first name is not given in the letter, we are told that the prisoner has been on the Leviathan for three years and his surname is Casbon. Thomas Casborn was convicted in October 1822, so the “three years” referred to in the letter isn’t quite correct. I think the author of the letter, Mr. Leyburn, was getting his information second-hand and wasn’t personally familiar with the case. The reference to the Leviathan is quite specific. My review of the Leviathan’s records did not reveal anyone else with a similar surname who was convicted in that time frame. So it’s very unlikely that Mr. Leyburn was referring to anyone other than Thomas Casbon. In the earlier post, I reported that Thomas Casborn was “late of the parish of Melbourn.” The letter indicates that the prisoner’s family lives in Meldreth. Melbourn and Meldreth are adjacent villages, and my Casbon ancestors are associated with both locations, so I consider this discrepancy to be inconsequential. There was only one family “of the name of Casbon” in Meldreth or Melbourn with a son named Thomas at that time, and that was the family of Isaac and Susanna (Howes) Casbon, my fourth great-grandparents. 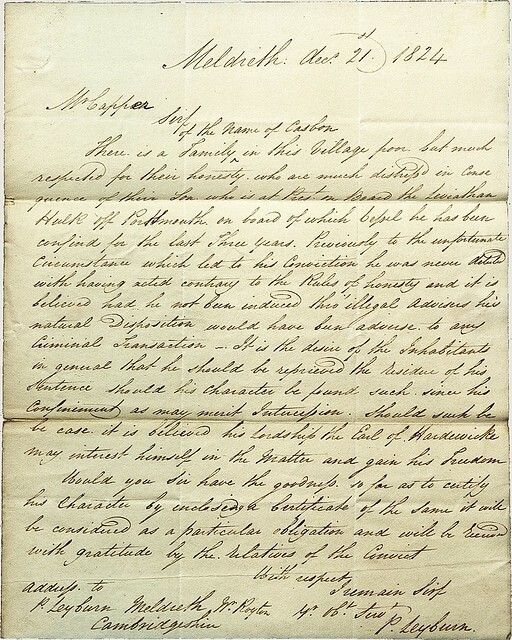 The letter does not give any details of the crime, referring to it only as “the Circumstance which led to his Conviction.” If the letter is to be believed, the crime was a first-time offense, and out of character for the prisoner. It suggests that he gave in to the influence of unnamed “illegal advisers” when he committed the offense. It seems that Mr. Leyburn is writing, not just on behalf of the Casbon family, but for the “Inhabitants [of Meldreth] in general.” I’m not even sure he has met the Casbon family but instead may have been approached by someone on their behalf to write this letter. Mr. Leyburn is asking the recipient of the letter to vouch for the prisoner’s behavior “since [the time of] his confinement” in the hope that a higher authority, “his Lordship the Earl of Hardewicke,” might then intervene on the prisoner’s behalf. This last reference is to Philip Yorke, the third Earl of Hardwicke (1757–1834), who had a residence at Wimpole Hall, about three and one-half miles from Meldreth. He was the son of Charles Yorke, the former Lord Chancellor of England. He must have been incredibly wealthy because Wimpole Hall is the largest house in Cambridgeshire. It is now owned by the National Trust and open to the public. We don’t know if Mr. Leyburn’s appeal ever received a reply or if the Earl of Hardwicke intervened on Thomas’s behalf. We do know that Thomas served the entire seven years aboard the Leviathan, so clemency obviously was not granted. I would still like to see if any more records are out there giving more details about the crime and the trial, but I’m pretty sure I’ve exhausted all the records available online. Any other records will require a visit to various archives in England – something I hope to accomplish one of these days. “Catalogue Description – Prisoner name(s): Casbon [first name not stated]. Court and date of trial: 1821. Crime:…,” The National Archives (http://discovery.nationalarchives.gov.uk/details/r/C14544423 : accessed 5 March 2019). “Catalogue Description – Home Office: Criminal Petitions, Series I,” The National Archives (http://discovery.nationalarchives.gov.uk/details/r/C8881 : accessed 5 March 2019). “Catalogue Description – Prisoner name(s): Casbon [first name not stated]. Court and date of trial: 1821. Crime:…,” previously cited. Petition for clemency for prisoner Casbon [first name not stated], P. Leyton to Mr. Capper, 21 Dec 1824; image, “England & Wales, Crime, Prisons & Punishment Browse, 1770-1935,” Findmypast (https://search.findmypast.com/search-world-Records/england-and-wales-crime-prisons-and-punishment-browse-1770-1935 : accessed 5 March 2019) >image 214 of 1049; citing The National Archives [UK], HO17/92/55. Alan Akeroyd (cambs.archives@cambridgeshire.gov.uk), to Jon Casbon, email, 4 Oct 2018, “Cambs quarter sessions, October 1822”; privately held by Casbon [(e-address for private use)]. “Philip Yorke, 3rd Earl of Hardwicke,” Wikipedia (https://en.wikipedia.org/wiki/Philip_Yorke,_3rd_Earl_of_Hardwicke : accessed 7 March 2019), rev. 20 Jan 19, 07:42. “Wimpole Estate,” Wikipedia (https://en.wikipedia.org/wiki/Wimpole_Estate : accessed 7 March 2019), rev. 20 Nov 18, 12:17. 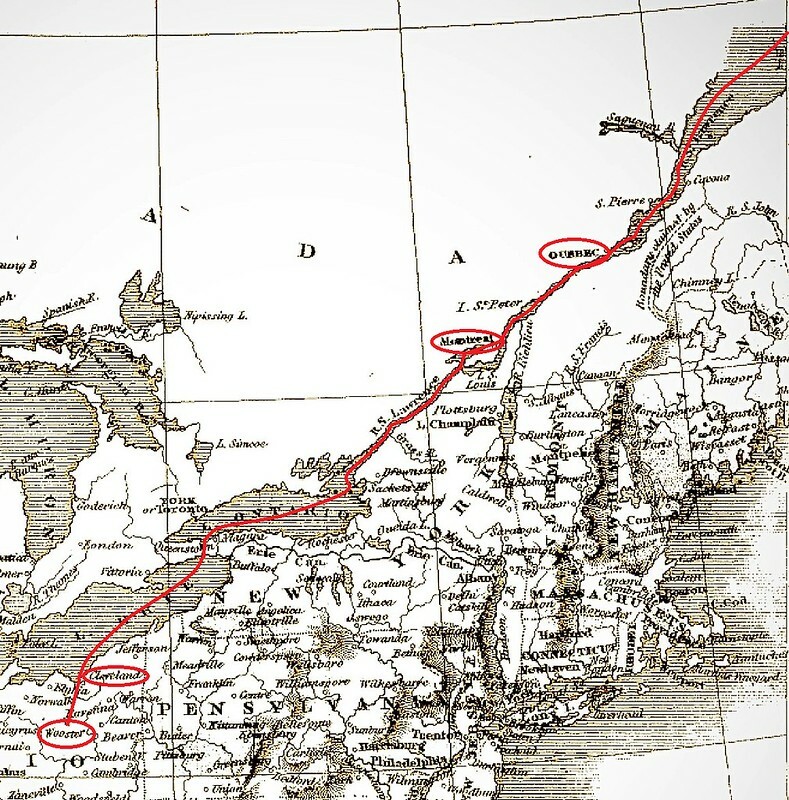 What was it like to emigrate from England to North America in the mid-1800s? How would you travel? What kind of supplies would you need? How would you go about planning for such a trip and where would you go for answers to these questions? These are questions that Thomas Casbon faced when he decided to leave England to find a new home in Ohio, U.S.A.
I’m pretty sure Thomas and his wife Emma (Scruby) were getting letters from Emma’s older brother, James, who settled in Ohio in the 1830s. These would have offered words of encouragement and practical guidance, and perhaps even some money to help cover expenses. But another source might have been a printed guidebook. I’ve recently learned that many of these were printed throughout the 1800s. They are brimming with practical advice and generally written by men who had first-hand experience, being recent immigrants themselves. One such book is A Practical Guide For Emigrants to North America, including the United States, Lower and Upper Canada, and Newfoundland …, by George Nettle, published in London, 1850. Title page of A Practical Guide for Emigrants … (1850). Although Thomas left England in 1846, four years before this book was published, it is representative of the types of guidebooks available at the time. It addresses many matters that would have been of concern to Thomas and his family. It also gives us greater insight into what the experience of emigrating to America would have been like. He goes on to explain how much a man can earn and what his earnings can purchase in America. A laboring man and his two sons, for instance, may earn 18s. per week each, making together £2 14s., whilst the common necessaries of life are generally less than half the price paid for them in this country. This amount brought to a careful wife, would, at the end of a year or two only, place the poor man and his family almost above the world’s perplexities; and his table would be plentifully supplied with such necessaries of life as he probably never before had the privilege of enjoying. The opportunity for financial independence would have been a strong incentive for Thomas, whose future in England did not offer much hope for improvement or relief from a life of economic hardship. there are other ports from which merchant ships, principally in the timber trade, sail during the spring and summer months, to Quebec and other places in North America, in which the passage-money charged is generally under £3: and should a family, or a company of friends or neighbors, emigrate together, the cost to each individual may be considerably reduced by contracting for the whole. We know that Thomas sailed from Southampton to Quebec aboard the Parkfield, described in one source as a Canadian lumber boat. He would not have been able to afford anything better than steerage, so this gives us an idea of what they voyage cost. He traveled with a niece and probably with another Meldreth man, James Wing, so maybe they were able to negotiate a cheaper price. On ocean voyages today, the fare usually includes the cost of meals, but Thomas probably had to bring his own provisions for the voyage. What would you need for a long ocean voyage in the 1840s? Here’s what the author of A Practical Guide advises. As the emigrant leaves “the lessening land,” and passes over the “trackless deep,” a medley of feelings and sensations will naturally occupy his mind: he will feel that he is parting from his associates and friends, and from those endearing ties and circumstances of his childhood, the comforts and enjoyments of which he was not before aware of, for the true value of friendship is never properly estimated until it becomes lost for ever. These observations are not designed to intimidate or to create unpleasant feelings, but merely to forewarn the emigrant of what will occur before he leaves his county, that he may not regret his departure, as thousands have done when it has been too late. What thoughts did Thomas and Emma have as they left England behind forever? The book then describes the approach of land and information about the city of Quebec. The Casbon family would have had to disembark at Quebec and secure transportation along the Saint Lawrence River to Montreal. “He has the choice of two routes, the one by steam vessels on the river St. Lawrence, and the other by canal and land carriage. The former will be preferable.” I’m pretty sure Thomas took the river route. Detail of map insert from A Practical Guide For Emigrants, with Thomas Casbon’s route added in. The previous paragraph quotes from biographies of Thomas Casbon’s sons, Sylvester and Charles. Returning to A Practical Guide For Emigrants, the book has much more to say about what a new immigrant should do once he arrives in the new land, along with various observations about life in America. Towards the end of the book, the author offers these words to the potential emigrant. The English emigrant will not be a month in America before the aspect of things will seem strange and unpleasant to him; and unless the country which he has left has been “too warm for him,” he will long for home, “with all its faults.” He will see no green hedges adorned with sweet-scented flowers … If, however, a man with his wife and family are living as they ought to do, their best home is in any civilized country where they can procure the greatest amount of the comforts and necessaries of life, and make a provision for old age. In other words, although homesickness and regret are likely to occur, given time, most will realize the advantages of life in the new country. Life in Ohio would have been a huge adjustment for Thomas and his family. They would never see their families in England again, nor any of the things they loved about the old country. But, within a few years, they were on firm ground financially and well on their way to having comforts of life they would have thought impossible had they remained in England. George Nettle, A Practical Guide for Emigrants to North America, including the United States, Lower and Upper Canada, and Newfoundland … (London: Simpkin, Marshall & Co., 1850); image copy, Hathi Trust Digital Library (https://catalog.hathitrust.org/Record/100008573 : accessed 28 February 2019). History of Porter County Indiana: a Narrative Account of its Historical Progress, its People and its Principal Interests (Chicago: The Lewis Publishing Co., 1912), vol. 2: 483; image copy, Hathi Trust Digital Library (https://catalog.hathitrust.org/Record/011679885 : accessed 28 February 2019). Nettle, A Practical Guide for Emigrants …, p. 10. History of Porter County Indiana, p. 483. Nettle, A Practical Guide for Emigrants …, pp. 51–2. The arrival of two death certificates from the General Register Office in England has helped to fill gaps in the life stories of two Casbon ancestors and also serves to highlight a topic I’ve touched on before—tuberculosis. The certificates are for two sisters-in-law, Lydia (Burgess) and Elizabeth (Waller) Casbon. Lydia was married to Joseph Casbon (~1811–1847). She was born about 1812 and died in 1851. Elizabeth was the first wife of Joseph’s brother, James Casbon (~1813–1884). She was born in 1815 and died in 1852. Here are the death “certificates” (copies of the official death registrations). Starting with Lydia, we can see that she died 8 June 1851 at Meldreth (Cambridgeshire, England). She was said to be thirty-five years old and the “Relict [widow] of Joseph Casbourn, Labourer.” The cause of death is a most interesting word—Phthisis. Sarah Worland, the informant, was also the informant for the death registration of Lydia’s husband, Joseph, who died in 1847. Phthisis is an old medical term that generally refers to the wasting away of the body from any cause, but during this period of time referred to pulmonary consumption, i.e., tuberculosis. This diagnosis confirmed my earlier suspicions that Lydia, and probably her children too, had perished from tuberculosis. More recently, I wrote that her husband Joseph also died from a form of the same disease. 1 year,” i.e., she also died of tuberculosis. It’s hard today to imagine the impact that tuberculosis (TB) had in eighteenth- and nineteenth-century England. The disease had been around for millennia, but by the early 1800s had become epidemic. Death rates in London and other major European cities were as high as 800 to 1,000 per 100,000 per year, meaning that up to one percent of the population died from the disease every year. Young adults were hardest hit: in the late nineteenth-century England and Wales, almost half of the deaths in twenty to twenty-four-year-olds were caused by TB. There is a dread disease which so prepares its victim, as it were, for death; which so refines it of its grosser aspect, and throws around familiar looks unearthly indications of the coming change; a dread disease, in which the struggle between soul and body is so gradual, quiet, and solemn, and the result so sure, that day by day, and grain by grain, the mortal part wastes and withers away, so that the spirit grows light and sanguine with its lightening load, and, feeling immortality at hand, deems it but a new term of mortal life; a disease in which death and life are so strangely blended, that death takes the glow and hue of life, and life the gaunt and grisly form of death; a disease which medicine never cured, wealth never warded off, or poverty could boast exemption from; which sometimes moves in giant strides, and sometimes at a tardy sluggish pace, but, slow or quick, is ever sure and certain. Although TB occurred in all social classes, “it was a disease above all spread by overcrowded homes, unhealthy working conditions and poor nutrition; it was in other words … a disease of the poor.” Which brings me back to Lydia and Elizabeth. We know that Lydia was poor. She was listed as a “pauper” in the 1851 census. By that time she had lost her husband and two of her four daughters. (A third survived her by less than a year.) Her death registration says she suffered from Phthisis for three years. In other words, she had been visibly wasting away for at least three years; but she likely contracted the disease several years before it became apparent. Life must have been difficult even before her husband died, and unbearable afterwards. We don’t know anything about the family’s home or living conditions but can guess that they were far from ideal. Lydia almost certainly received some poor relief from the parish, but not enough to lift her from extreme poverty. We can also surmise that the family of James and Elizabeth Casbon was poor. James was a laborer his entire life, near the bottom of the social ladder. In the seventeen years of their marriage, Elizabeth had born eight children, the youngest only a year before her death. The ten of them were probably squeezed into only a couple of rooms. In the 1851 census, only the oldest son, William, was earning additional income as a laborer. There were many mouths to feed on meager wages. Elizabeth probably already had symptoms of TB when her daughter, Emma, was born in 1851. (Emma was baptized just three days before Elizabeth’s death – was this done because she was dying?) Young Emma died in November 1853 at the Royston Union Workhouse, located in Bassingbourn (a few miles from Meldreth). The location of her death is another indication of the family’s poverty. Considering the circumstances, it’s amazing that the remainder of James and Elizabeth’s children, as far as I’ve been able to trace them, lived normal lifespans. I’ll try to end on a more positive note. As sad as these stories are, they are a testament to the fortitude of our ancestors. It may be a bit of a cliché, but comparing their lives with ours today, we can look back on their endurance and survival with both gratitude and awe. 1851 England census, Cambridgeshire, Melbourn, p. 29, enumeration district 11c, schedule 114, Lydia Casbourn; image, Ancestry (https://search.ancestry.com/search/db.aspx?dbid=8860 : accessed 22 February 2019), Cambridgeshire >Melbourn >11c >image 30 of 36; citing The National Archives, HO 107/1708/206. England, death registration (unofficial copy) for Lydia Casbourn, died 8 Jun 1851; registered June quarter 1851, Royston & Buntingford District, vol. 6/405, Melbourn Sub-district, no. 410; General Register Office (GRO), Southport. Parish of Meldreth (Cambridgeshire, England), Register of Baptisms, 1813-67, p. 8, no. 57, , Elizabeth Waller, b. 11 Sep 1815, baptized 15 Oct 1815; imaged as “Parish registers for Meldreth, 1681-1877,” FamilySearch (https://familysearch.org/search/film/007567609?cat=210742 : accessed 28 April 2017), image 201; citing Family History Library microfilm 1,040,542, item 5. England, GRO, death registration (unofficial copy) for Elizabeth Casbon, died 16 Aug 1852; registered Sep. qtr 1852, Royston & Buntingford Dist, vol. 3A/134, Melbourn sub-dist., no. 117; GRO, Southport. Robert Hooper, M.D., Lexicon Medicum; or, Medical Dictionary: Containing an Explanation of the Terms … on All These Subjects , rev. 8th ed., Klein Grant, M.D., editor (London: Longman, 1838), p. 1026, “Phthisis”; image copy, Hathi Trust Digital Library (https://babel.hathitrust.org/cgi/pt?id=uc1.a0000834499 : accessed 6 February 2019). Thomas M. Daniel, “The history of tuberculosis,” Respiratory Medicine, Nov 2006, vol. 100, no. 11, pp. 1862–70; html edition (https://www.resmedjournal.com/article/S0954-6111(06)00401-X/fulltext : accessed 22 February 2019). Richard Evans, “The White Plague,” transcript of lecture given at The Museum of London, 27 Nov 12; MS Word transcript, Gresham College (http://www.gresham.ac.uk/lectures-and-events/the-white-plague : accessed 22 February 2019). John Frith, “History of Tuberculosis. Part 1 – Phthisis, consumption and the White Plague,” Journal of Military and Veteran’s Health, 22/2; online archive (https://jmvh.org/article/history-of-tuberculosis-part-1-phthisis-consumption-and-the-white-plague/ : accessed 22 February 2018). Charles Dickens, Life and Adventures of Nicholas Nickleby, reprint of 1st ed. (London: MacMillan & Co., 1916); html edition, Project Gutenberg (https://www.gutenberg.org/files/967/967-h/967-h.htm : accessed 22 February 2019). 1851 England census, Cambridgeshire, Melbourn, p. 29, Lydia Casbourn. Jon Casbon, “Joseph and Lydia (Burgess) Casbon, Our Casbon Journey, 2 Mar 2017 (https://casbonjourney.wordpress.com/2017/03/02/joseph-and-lydia-burgess-casbon/ : accessed 22 February 2019). 1851 England census, Cambridgeshire, Meldreth, p. 32, James Casbon. Meldreth Parish, Baptisms, 1813–1867, p. 75, no. 599, Emma Casbon; accessed as “Parish registers for Meldreth, 1681-1877,” browsable images, FamilySearch (https://www.familysearch.org/search/film/007567609?cat=210742 : accessed 29 August 2017); citing Family History Library microfilm 1,040,542, item 5, image 234. England, death registration (unofficial copy) for Emma Casbon, died 4 Nov 1853; registered Dec. qtr. 1853, Royston & Buntingford Dist., vol. 3A/107, Melbourn Sub-dist., no. 319. I rely on the internet so much that it’s easy to forget that there are other ways to get information. Sometimes all it takes is a phone call. Do you remember when we used to look up numbers in the phone book? In this case, I happened to be browsing the web site of the Michigan City Public Library. Michigan City is in La Porte County, Indiana, right next to Porter County, my ancestral home. When I opened the “Genealogy” link on the web site, I saw that they have an obituary search index and decided to give it a try. 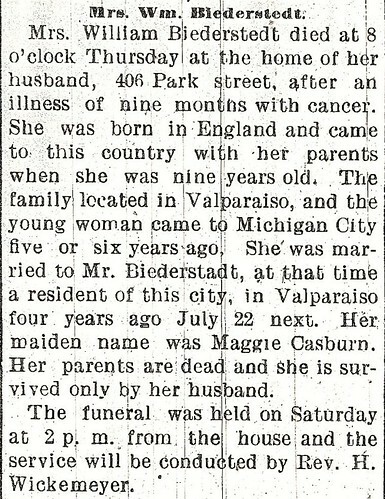 I recalled that Margaret “Maggie” Casbon had married William Biederstadt and died in Michigan City. Maggie has always been somewhat of a mystery to me, so I’m always happy to find something new about her. I typed in her information and, lo and behold, this is what popped up. The library had a copy of Maggie’s obituary on file! 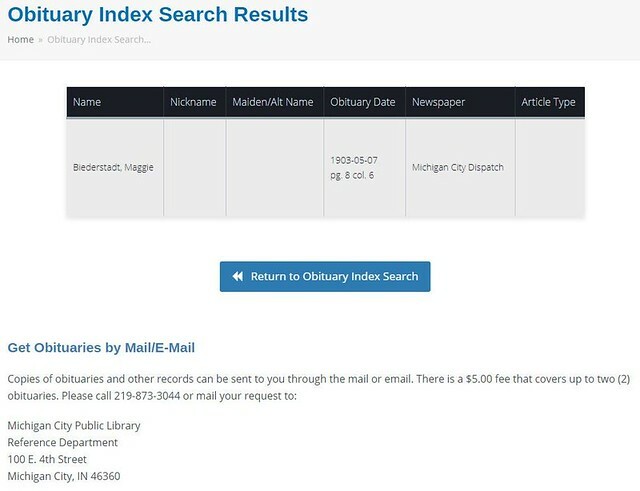 I noticed that for five dollars I could get a copy of the obituary, and the phone number was right there, so I dialed the number and was almost immediately connected to the reference librarian. She took the information and promised she would get to it right away. A short time later an email arrived with the obituary. How easy was that? I really enjoy finding obituaries because they often contain a lot of information about the deceased and their families. In this case, we get a capsule summary of Maggie’s life. I’m not sure any of the information is new, but it is still interesting and is revealing for what is said and for what is left unsaid. Although the date is not given, Maggie died on Thursday, April 30, 1903. I already knew that she died of cancer of the uterus—such a shame for a relatively young woman (thirty-nine). It’s interesting that the obituary says she died “at the home of her husband.” Why doesn’t it say “at her home” or “at the home she shared with her husband”? It probably doesn’t signify anything, but still makes me wonder. Contrary to what is written, she came to the United States from England when she was six years old. Little mistakes like these are common—she wasn’t the one giving the information to the newspaper, after all. The statement that Maggie came to Michigan City “five or six years ago” is also interesting. It has a certain amount of vagueness to it that matches my overall impression of Maggie. She has been hard to pin down. She had been married to William Biederstadt for less than four years. Why was she in Michigan City before that? We really don’t know. There are some interesting omissions as well. Yes, her parents were both dead—father James in 1884 and mother Mary (Jackson) sometime before 1876. But her husband was not the only one to survive her. The obituary fails to mention her stepmother, Mary (Payne), who died in Boone Grove less than two weeks after Maggie’s death. There’s an oral tradition that she did not have a good relationship with her stepmother. Nor does it mention her brother Amos or sister Alice, both of whom were married and living in Porter County. Does this signify some distance in their relationships, ignorance on her husband’s part, or simply the editorial decisions of the newspaper? Maggie never had children, so there are no descendants to honor her memory. She had a tumultuous life and much of it remains a mystery. I would like to think that her almost four-year marriage to William Biederstadt finally brought some peace and stability to her life. But, I’ll never really know. Indiana, State Board of Health, Certificate of Death, Michigan City, La Porte County, record no. 54, Maggie Biederstedt, 30 Apr 1903; imaged as “Indiana, Death Certificates, 1899-2011,” database with images, Ancestry (https://search.ancestry.com/search/db.aspx?dbid=60716 : 5 December 2017), Certificate >1903 >06 >image 2083 of 2771; Indiana Archives and Records Administration, Indianapolis. Indiana, State Board of Health, Certificate of Death, Porter County, no. 39, Mary P Carbon, 10 May 1903; “Indiana, Death Certificates, 1899-2011,” Ancestry (cited previously: accessed 27 April 2018), Certificate >1903 >10, image 339 of 2788. One of my fellow genealogy bloggers, Liz Gauffreau, recently posted an article about a visit from the Prince of Wales to Toronto, Canada, where her grandmother was working in 1919. This reminded me of a photograph that I have, and I promised Liz that I would write about it soon. Class photo, U.S. Army Air Corps, Officer Training School, Miami, Florida, December, 1942. You probably recognize the man on the right. He is the Duke of Windsor, who was once the Prince of Wales and then King Edward VIII, until his abdication in 1936. The man on the left, seated second from the Duke’s right, is my grandfather, Leslie “Les” Christy Casbon (1894–1990). The photograph has a handwritten date of December 1942 on the back. Les was just shy of forty-eight years old when the photo was taken. He enlisted in the U.S. Army Signal Corps in January 1918, then attended pilot training, and was discharged in November 1918 as a Second Lieutenant in reserve status. He remained on active reserve status between the world wars and was recalled to active duty in July 1942. 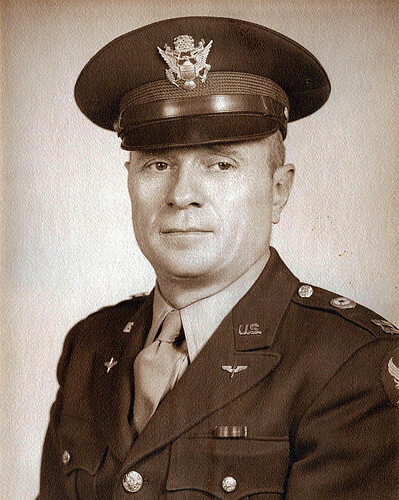 He then received orders to the U.S. Army Air Corps Officer Training School, located in Miami Beach, where the photo was taken. A Wikipedia article says that the Miami Beach Training Center opened in February 1942 and “was one of the largest enlisted basic training centers (BTC) and officer candidate schools (OCS) of the Army Air Forces during World War II.” The Officer Training School (OTS) began operations in July 1942. Most OTS students were 30 years old or more, with the bulk of them in their 30s or 40s. They came from all walks of life, but most were teachers, businessmen, or professionals such as attorneys and accountants. … The majority were slated for administrative or instructional duties in the Army Air Forces. That description fits my grandfather very well. He was a businessman and active in civic organizations. His wartime duties were administrative. The story of King Edward VIII’s romance with American divorcée Wallis Simpson and his subsequent abdication from the throne is well known. His sympathies with Hitler and Nazi Germany were probably not well known to the public until many years after the war. After his abdication, he was named Duke of Windsor and eventually appointed the Governor of the Bahamas. On 10 December 1942, the Duke and Duchess arrived in Miami for an unannounced visit, primarily for some rest and Christmas shopping. After spending several days relaxing at Palm Beach, they returned to Miami. 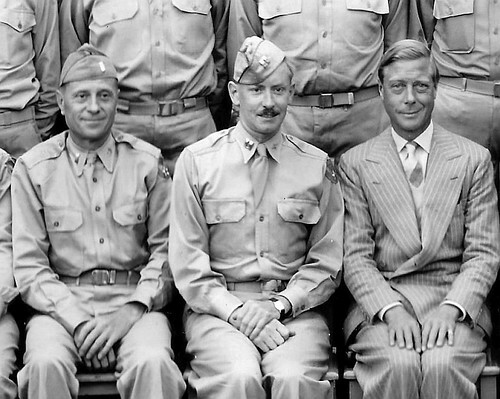 During that part of their visit, the Duke met with several military leaders. “Windsors Visit Red Cross,” 19 December 1942. This article mentions the Duke’s meeting with the commandant of the Army Air Forces Training Command. It was probably during that visit that Les’s OTS class was assembled for an impromptu photo opportunity. Shopping and other tasks completed, the Duke and Duchesss returned to Nassau, Bahamas on December 20th. I’ll have more to say about Les’s military experiences in future posts, but for now will conclude with his official photo, taken when he was a Captain in the U.S. Army Air Corps. Captain Leslie C. Casbon. Author’s personal collection. Leslie Casbon, “Some facts in my life,” undated manuscript; personal collection of Jon Casbon. “Miami Beach Training Center,” Wikipedia (https://en.wikipedia.org/wiki/Miami_Beach_Training_Center : accessed 29 January 2019), rev. 13 Jan 2017, 19:31. “Army Air Forces Training Command,” Wikipedia (https://en.wikipedia.org/wiki/Army_Air_Forces_Training_Command#Officer_Candidate/Training_School : accessed 29 January 2019), rev. 7 Dec 2019, 03:41. “Edward VIII,” Wikipedia (https://en.wikipedia.org/wiki/Edward_VIII#cite_ref-112 : accessed 29 January 2019), rev. 24 Jan 19, 21:47. “Two Unexpected Visitors Arrive at Miami,” The New York Times, 11 Dec 1942, p. col. 3. 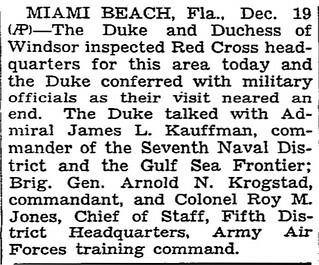 “Windsors Visit Red Cross,” The New York Times, 19 Dec 1942, p. 29, col. 2. “Windsors Return to Nassau,” The New York Times, 21 Dec 1942, p. 18, col. 7. My last two posts profiled two individuals who entered into domestic service as a ladies-maid and footman, respectively. Before I leave the topic altogether, I want to pay tribute to many other Casbon family members who worked as domestic servants. I’ve combed through my files to find those Casbon relatives who were listed as servants on census or other records. It turns out there were quite a few! I know precious few details about most of them, but collectively, I think their stories are worth the telling. All of the servants featured in today’s post are women. This should come as no great surprise. Employment opportunities for women during this time frame (mid 1800s to early 1900s) were limited, and domestic service was one of the most common occupations for working-class women. In 1911, although the numbers were already declining, twenty-eight percent of working women in England were employed in domestic service. Men constituted a much lower percentage of the domestic service workforce. Men had access to a much greater variety of trades and occupations.“Most of those employed in domestic service in Victorian times were women, outnumbering men at over 20 to one by 1880.” There was a tax on male servants, so they tended to be employed in larger, wealthier households. The majority of female servants worked in middle-class households; where having at least one servant was considered essential. Here are the Casbon women I’ve discovered who were domestic servants at one time or another. They are presented in roughly chronological birth order and grouped by families. 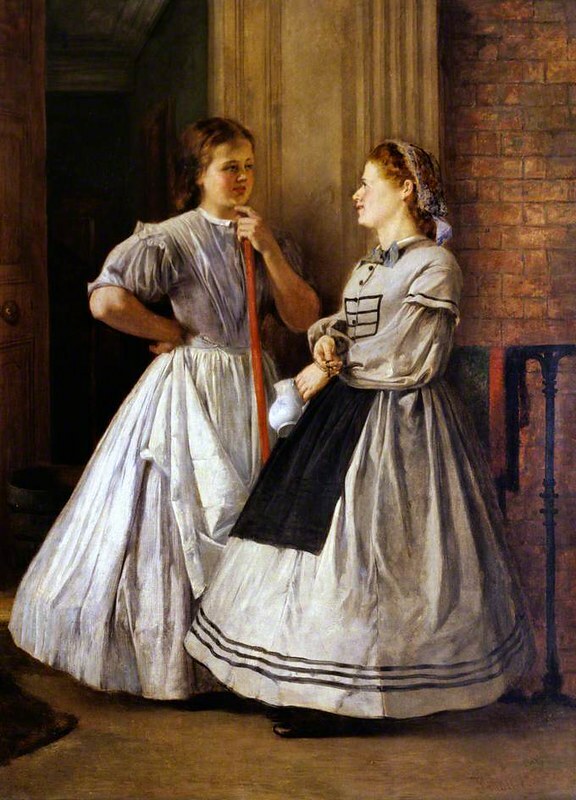 John Finnie (1829-1907), “Maids of All Work” (1864-5), ©The Geffrye Museum of the Home. I’ve listed these four together because they were the daughters of William (1805–1807) and Ann (Clark, ~1812–1869) Casbon, of Meldreth, Cambridgeshire. William was an agricultural labourer with a large family. Mary Ann was born about 1831 in Meldreth. in the 1851 census, we find her listed as the only servant in the household of John Campkin, a “Grocer & Draper” living in Melbourn. By 1861 Mary Ann was working as a cook in a London public house. I haven’t located her in the 1871 census. In 1875, at the age of forty-four, she married a widower named Joseph Sparrow. She had no children. Her date of death is unknown, but occurred after 1891. Edith was baptized at Meldreth in 1835. In 1851, sixteen-year-old Edith was working as a “house servant” in the home of Elizabeth Bell, a widow in Whaddon, Cambridgeshire, with a farm of 166 acres (quite large for that time). There were also two male servants in the household, a horse keeper and a shepherd. She married William Catley in 1860, and together they had seven children. She died in 1916 and was buried in Melbourn. Jane was baptized in 1840 at Meldreth. In 1861 she was living at home but listed as “Servant,” so she was presumably working elsewhere. In 1871, she was listed as “House Keeper,” again in her father’s household, so it is unclear whether she was keeping his or someone else’s house. She married John Camp in 1881 and had two children. She died in 1904, age sixty-four. Martha, who was twenty-four years younger than her sister Mary Ann, spent most of her life as a domestic servant in London. In 1871, Martha was listed as “Housemaid” along with one other female servant (the cook) in the household of a civil engineer. In 1881 she was the sole servant in a small household consisting of a Scottish woolen merchant and his sister. She was again the sole servant in 1891, this time to a chemist and his wife. In 1901 she was the lone servant for a Presbyterian minister and his wife. The last record we have of Martha as a servant is in 1911 (the last year census records are available). At that time fifty-six-year-old Martha was serving as the cook in a household with three other servants. Their master and mistress were a retired draper and his wife. Quite a few servants for two people! Martha never married. Sometime before 1839, she retired to Melbourn, Cambridgeshire (the sister village to Meldreth). She died in Cambridge in 1947 and was buried in Melbourn. Sarah was the daughter of Thomas (~1807–1863) and Jane (Cooper, ~1803–1874) Casbon. Thomas was the patriarch of the “Peterborough Casbons.” Sarah was born about 1834 in Somersham, Huntingdonshire. In 1851, she was the only servant for a widow and her daughter in Chatteris. She married Richard Baker in 1857 and had at least eight children. She died in 1904, age sixty-nine. Priscilla was the daughter of William (~1835–1896) and Sarah (West, ~1823–1905) Casbon of Meldreth. William was an agricultural labourer and Priscilla his only daughter. She was born in 1862. In the 1881 census, she was employed as the only servant for a banker’s clerk and his wife in Cambridge. In 1891 she was living with her parents at home, with no occupation listed. £12, 232, divided between Priscilla and two other beneficiaries. There is evidence that she remarried a man named John Wilson in 1908 and was still alive in 1939, but I’m not certain this is her. I would love to know more about her story! Julia was born in 1866, the daughter of George S (~1836–1914) and Sarah (Pryor, ~1831–1903) Casbon. George was a wheelwright in Barley, Hertfordshire, and originally from Meldreth. In the 1891 census, we find Julia working as one of three female servants in the household of a retired Army officer in Kensington, London. She married Henry Brassington, a bootmaker, in 1899. They had two sons. Julia was ninety-nine years old when she died in 1965. Kate was the daughter of John (1843–1927) and Mary Anne (Hall, ~1840–1880) Casban. She was born in 1874. In 1891, at the age of seventeen, she was one of two female servants employed by a single unmarried woman. She married Frederick Gunn in 1898 and had two children. I haven’t been able to pin down the date of her death. Born at Melbourn in 1875, the daughter of Samuel Clark (1851–1922) and Lydia (Harrup, ~1853–1924) Casban, “Alice,” like her cousin Kate, was already working as a servant in 1891. She was one of two servants, the other a footman, working for the proprietor of a pub. She married Thomas William Francis in 1898 and had seven children. Date of her death is uncertain. These four sisters were the daughters of George (1846–1897) and Sarah (Pearse, ~1847–1912) Casbon. George was originally from Meldreth but settled in nearby Fowlmere where he was a farm labourer. The family was probably quite poor. Sarah, the mother, went to work as a charwoman after George’s death. The daughters would have had few other options than going into domestic service as soon as they reached a suitable age. A striking feature of this family is that all four daughters died at an early age. I don’t know the cause of death for any of them. Olive Louise, the oldest, was born in 1884. by 1901, she was the sole servant for a tea buyer and his family, living in Croydon. In 1911, she was one of two servants, the other the cook, for a much larger family, also in Croydon. She married Thomas De Rinzy in 1911 and bore him a son that same year. Olive died in 1916, thirty-two years old. Maud Emily was born in 1885. In 1901 at age fifteen, she was working as a kitchen maid in Melbourn, and in 1911 she was the cook for a London single woman. She died later that year at the age of twenty-six. I have handwritten notes from a relative stating that Hilda abandoned her son at the Croydon Infirmary, and that he was later taken in by the Mission of Good Hope, a well-known organization that placed children for adoption. This fills in some blanks in another story, that of how young George came to be placed with Dr. Barnardo’s Homes and then sent to Canada as a sort-of indentured servant. I don’t know what became of Hilda after the birth, except for her death, at age thirty-three, in 1921. The youngest sister, Elsie Lydia, was born in 1890. She was the sole domestic servant at the White Ribbon Temperance Hotel located in Cambridge, 1911. I presume that Elsie later found a position in Kensington, London, because that is where here death was registered in 1919. She was thirty years old. The stories of these thirteen women are in many ways typical for female domestic servants of their era. With the exception of Martha, they did not work as servants for the greater part of their lives. Most of them started work in their teens and continued until they found husbands and had families of their own. They generally worked in smaller middle-class homes with one or two servants. Other than the four daughters of George and Sarah (Pearse) Casbon, they generally lived “normal” lifespans. This is far from an adequate description of their lives, since it is based largely on “snapshots” taken every ten years with the census. Nevertheless, their stories provide insights into our shared heritage and deserve to be told. “Women and Work in the 19th Century,” Striking Women (http://www.striking-women.org/module/women-and-work/19th-and-early-20th-century : accessed 27 January 2019). “Who Were the Servants?” My Learning (https://www.mylearning.org/stories/the-victorian-servant/280 : accessed 27 January 2019). Kate Clark, “Women and Domestic Service in Victorian Society,” The History Press (https://www.thehistorypress.co.uk/articles/women-and-domestic-service-in-victorian-society/ : accessed 27 January 2019). “The Rise of the Middle Classes,” Victorian England: Life of the Working and Middle Classes (https://valmcbeath.com/victorian-era-middle-classes/#.XE3gilxKiUk : accessed 27 January 2019). “File: John Finnie. Maids of All Work, 1864-65 (higher colour).jpg,” Wikimedia Commons (https://commons.wikimedia.org/wiki/File:John_Finnie._Maids_of_All_Work,_1864-65_(higher_colour).jpg : accessed 27 January 2019). 1841 England census, Cambridgeshire, Meldreth, ED 19, p. 9, High St., Mary Ann (age 10) in household of William Casbon; imaged as “1841 England Census,” Ancestry (https://search.ancestry.com/search/db.aspx?dbid=8978 : accessed 27 January 2019), Cambridgeshire >Meldreth >District 19 >image 6 of 9; The National Archives (TNA), HO 107/63/19. 1851 England census, Cambridgeshire, Melbourn, ED 11b, p. 3, schedule 8, Church Lane, Mary Casbon in household of John Campkin; imaged as “1851 England Census,” Ancestry (https://search.ancestry.com/search/db.aspx?dbid=8860 : accessed 27 January 2019), Cambridgeshire >Melbourn >11b >image 4 of 25; TNA, HO 107/1708/177. 1861 England census, Middlesex, Islington, ED 36, p. 27, schedule 153, Mary Ann Cusbin in household of Richd Munford; imaged as “1861 England Census,” Ancestry (https://search.ancestry.com/search/db.aspx?dbid=8767 : accessed 19 November 2018), Middlesex >Islington >Islington East >District 36 >image 28 of 84; TNA, RG 9/16/55. Church of England, Parish of St. Lukes Finsbury (Middlesex), Marriage Records, 1871-6, p. 245, no. 489, Joseph Sparrow & Mary Ann Casbon, 26 Dec 1875; imaged as “London, England, Church of England Marriages and Banns, 1754-1921,” Ancestry (https://search.ancestry.com/search/db.aspx?dbid=1623 : accessed 10 Aug 2016), Islington >St Luke, Finsbury >1867-1881 >image 494 of 747; London Metropolitan Archives, record no. p76/luk/058. 1891 England census, London, Hackney, ED 23b, p. 31, schedule 47, 33 Benyon Rd, Mary A Sparrow (indexed as “Spawn”); imaged as “1891 England Census,” Ancestry (https://search.ancestry.com/search/db.aspx?dbid=6598 : accessed 29 October 2018), London >Hackney >West Hackney >District 23b >image 32 of 34; TNA RG12/190/98. Church of England, Meldreth (Cambridgeshire), Register of Baptisms, 1813-77,. 44, no. 345, Edith Casburn, 29 Mar 1835; imaged as “Parish registers for Meldreth, 1681-1877,”FamilySearch (https://familysearch.org/search/film/007567609?cat=210742 : accessed 28 April 2017), image 219 of 699; FHL film 1,040,542, item 5. 1851 England census, Cambridgeshire, Whaddon, ED 4, p. 15, schedule 43, Edith Casbon in household of Elizabeth Bell; Ancestry (https://search.ancestry.com/search/db.aspx?dbid=8860 : accessed 27 January 2019), Cambridgeshire >Whaddon >4 >image 16 of 23; TNA, HO 107/1708/34. Meldreth, Register of Marriages, 1837-75, p. 50, no. 99, William Catley & Edith Casbon, 13 Oct 1860; imaged as “Parish registers for Meldreth, 1681-1877,” FamilySearch (https://www.familysearch.org/search/film/007567609?cat=210742 : accessed 29 August 2017), image 397 of 699; FHL film 1,040,542, item 9. “Index of Cambridgeshire Parish Records,” database/transcriptions, Cambridge Family History Society, Edith Catley, bu. 22 May 1916 at Melbourn; print copy in author’s personal collection. Meldreth, Register of Baptisms, 1813-77, p. 54, no. 429, Jane Casbon, 29 Nov 1840; FamilySearch (https://familysearch.org/search/film/007567609?cat=210742 : accessed 28 April 2017), image 224 of 699. 1861 England census, Cambridgeshire, Meldreth, ED 15, schedule 133; J Carston in household of William Caston; Ancestry (https://search.ancestry.com/search/db.aspx?dbid=8767 : accessed 27 January 2019), Cambridgeshire >Meldreth >District 15 >image 25 of 32; TNA, RG 9/815/64. 1871 England census, Meldreth, enumeration district (ED) 15, p. 21, schedule 125, High St., Jane Casbon in household of William Casbon; “1871 England Census,” Ancestry (https://search.ancestry.com/search/db.aspx?dbid=7619 : accessed 27 January 2019), Cambridgeshire >Meldreth >District 15 >image 22 of 32; TNA, RG 10/1363/25. “England & Wales Marriages 1837-2008”, database, findmypast (https://search.findmypast.com/search-world-Records/england-and-wales-marriages-1837-2005 : accessed 30 March 2017), John Camp, 1st qtr, 1881, Royston, vol. 3A/323; General Register Office (GRO), Southport. “Search the GRO Online Index,” HM Passport Office (https://www.gro.gov.uk/gro/content/certificates/indexes_search.asp : accessed 27 January 2019), deaths, Jane Camp, J[un] qtr, 1904, Royston, vol. 3A/299. 1871 England census, Kent, Lewisham, ED 4, p. 61, schedule 214, Martha Casbon (indexed “Carbor” in household of John H Greener (indexed “Greeno”); Ancestry (https://search.ancestry.com/search/db.aspx?dbid=7619 : accessed 19 March 2018), Kent >Lewisham >Lee >District 4 >image 62 of 80; TNA, RG 10/763/89. 1881 England census, London, Hammersmith, ED 28, pp. 41-2, schedule 186, 100 Godolphin Rd., Martha Casbon in household of John Weir; “1881 England Census,” Ancestry ((https://search.ancestry.com/search/db.aspx?dbid=7619 : accessed 19 March 2018), London >Hammersmith >St Paul Hammersmith >District 28 >image 42 of 68; TNA, RG 11/60/143. 1891 England census, London, Lambeth, ED 20, p. 4, schedule 20, 156 Clapham Rd., Martha Casbon in the household of Frederick Glew; Ancestry (https://search.ancestry.com/search/db.aspx?dbid=6598 : accessed 27 January 2019), London >Lambeth >Kennington First >District 20 >image 5 of 45; TNA, RG 12/400/96. 1901 England census, London, Hammersmith, ED 3, p. 90, schedule620, 214 Goldhawk Rd., Martha Casbon in household of Henry Miller; “1901 England Census,” Ancestry (https://search.ancestry.com/search/db.aspx?dbid=7814 : accessed 20 March 2018; TNA, RG 13/: accessed 20 March 2018; TNA, RG 13/9/124. 1911 England census, London, Lambeth, ED 10, schedule 109, 76 Tulse Hill SW, Martha Casbon in household of Thomas Drake; “1911 England Census,” Ancestry (https://search.ancestry.com/search/db.aspx?dbid=2352 : accessed 27 January 2019), London >Lambeth >Norwood >10 >image 220 of 421; TNA, RG 14/2109. “Melbourn Burials 1739–1950,” p. 73, Martha Casbon, 19 Jan 1947; transcriptions, Cambridge Family History Society, Melbourn burials, Martha Casbon, bu. 22 May 1916 at Melbourn; print copy in author’s personal collection. 1851 England census, Cambridgeshire, Chatteris, ED 3e, p. 1, schedule 1, Park Rd., Sarah Casborn in household of Ann Curtis; Ancestry (https://search.ancestry.com/search/db.aspx?dbid=8860 : accessed 27 January 2019), Cambridgshire >Chatteris >3e >image 2 of 48; TNA, HO 107/1765/371. Church of England, Peterborough (Northamptonshire), St. John Parish, Marriages, 1855–1866, p. 76, no. 152, Richard Baker & Sarah Casbon, 22 Jun 1857; imaged as “Northamptonshire, England, Church of England Marriages, 1754-1912,” Ancestry (https://search.ancestry.com/search/db.aspx?dbid=9199 : accessed 19 January 2018), Peterborough, St John >Parish Registers >1855-1859 >image 41 of 66; Northamptonshire Record Office, Northampton. “Search the GRO Online Index,” deaths, Sarah Baker, M[ar] qtr, 1904, Peterborough, vol. 3B/146. “Search the GRO Online Index,” births, Priscilla Banks, D[ec] qtr, 1862, Royston, vol. 3A/227. 1881 England Census, Cambridgeshire, Cambridge, ED 2, p. 14, schedule 59, 8 Parker St., Priscilla Casbon in household of Edmund Wilson; Ancestry (https://search.ancestry.com/search/db.aspx?dbid=7572 : accessed 26 January 2019), Cambridgeshire >Cambridge >St. Andrew the Great >District 2 >image 15 of 48; TNA, RG 11/1669/43. 1891 England census, Cambridgeshire, Meldreth, ED 13, p. 18, schedule 134, Witcroft Rd., Priscilla Casbon in household of William Casbon; Ancestry (https://search.ancestry.com/search/db.aspx?dbid=6598 : accessed 27 January 2019), Cambridgeshire >Meldreth >District 13 >image 19 of 27; TNA, RG 12/1104/68. “England & Wales, Civil Registration Marriage Index, 1837-1915,” Ancestry (https://search.ancestry.com/search/db.aspx?dbid=8913 : accessed 24 April 2018), Priscilla Casbon, 3d qtr, 1896, Bedford, vol. 3B/732; GRO, London. 1891 England census, London, Kensington, ED 17, p. 30, schedule 157, 40 Evelyn Gardens, Julia F Casbon in the household of Thomas Fraser; Ancestry (https://search.ancestry.com/search/db.aspx?dbid=6598 : accessed 27 January 2019), London >Kensington >Brompton >District 17 >image 31 of 51; TNA, RG 12/32/73. Church of England, Barley (Hertfordshire), Marriage registers, p. 136, no. 271, Henry Brassington & Julia Frances Casbon, 19 Sep 1899; “Hertfordshire Banns & Marriages,” findmypast (https://search.findmypast.com/search-world-Records/hertfordshire-banns-and-marriages : accessed 14 October 2017). “England and Wales Death Registration Index 1837-2007”, FamilySearch, (https://familysearch.org/ark:/61903/1:1:QVCK-W896 : accessed 4 September 2014), Julia F Brassington, 1965, 4th qtr, Harrow, vol. 5B/961/153; citing GRO, Southport. “Search the GRO Online Index,” births, Kate Casban, M[ar] atr, 1874, Edmonton, vol. 3A: 203. 1891 England Census, Middlesex, Edmonton, ED 1, p. 49, schedule 284, Langhedge House, Kate Casban in household of Maria Rowley; Ancestry (https://search.ancestry.com/search/db.aspx?dbid=6598 : accessed 28 January 2019), Middlesex >Edmonton >District 01 >image 50 of 54; TNA, RG 14/1081/27. Church of England, London, Edmonton, St James, Marriages 1851-1917, p. 159, no. 318, Frederick Gunn & Kate Casban, 9 Apr 1898; “London, England, Church of England Marriages and Banns, 1754-1932,” Ancestry (https://search.ancestry.com/search/db.aspx?dbid=1623 : accessed 22 March 2017), Enfield >St James, Upper Edmonton >1851-1917 >image 206 of 506; London Metropolitan Archives. “Search the GRO Online Index,” births, Margaret Casbon, D[ec] qtr, 1875, Royston, vol. 3A/320. 1891 England Census, Surrey, Croydon, ED 34, p. 9, schedule 48, 25 Wellesley Rd., Alice Casbar in household of George E Wheeler; Ancestry (https://search.ancestry.com/search/db.aspx?dbid=6598 : accessed 28 January 2019), Surrey >Croydon >District 34 >image 10 of 89; TNA RG 14/591/44. “England and Wales Marriage Registration Index, 1837-2005,” FamilySearch (https://familysearch.org/ark:/61903/1:1:269S-X5P : accessed 13 December 2014), Margaret Alice Casban, 2d qtr, 1898, Croydon, vol. 2A/529/38; GRO, Southport. “Search the GRO Online Index,” births, Olive Louise Casbon, J[un] qtr, 1884, Royston, vol. 3A/444. 1901 England census, Surrey, Croydon, ED 81, p. 8, schedule 45, Olive L Casson in household of John Percy Lewis; Ancestry (https://search.ancestry.com/search/db.aspx?dbid=7814 : accessed 26 January 2019), Surrey >Croydon >District 81 >image 9 of 55; TNA, RG 13/648/8. 1911 England Census, Surrey, Croydon, ED 18, schedule 63, 18 Avenue Rd, Norwood S.E., Olive Louise Casbon in household of Reuben Glasgow Kestin; Ancestry (https://search.ancestry.com/search/db.aspx?dbid=2352 : accessed 20 March 2018), Surrey >Croydon >North Croydon >18 >image 126 of 699; TNA, RG 14/3385. “England and Wales Marriage Registration Index, 1837-2005,” FamilySearch (https://familysearch.org/ark:/61903/1:1:267B-M1S : accessed 14 November 2015), Olive L Casbon, 2d qtr, 1911, Croydon, vol, 2A/631/105. “Search the GRO Online Index,” births, Thomas Jessop Cavendish De Rinzy, D[ec] qtr, 1911, Croydon, vol. 2A/644. “Search the GRO Online Index,” deaths, Olive Louise De Rinzy, D[ec] qtr, 1916, Croydon, vol. 2A/473. “Search the GRO Online Index,” births, Maud Emily Casbon, D[ec] qtr, 1885, Royston, vol. 3A/471. 1901 England census, Cambridgeshire, Melbourn, enumeration district 9, p. 9, schedule 44, Maud Carton in household of Albert Spencer; Ancestry (https://search.ancestry.com/search/db.aspx?dbid=7814 : accessed 28 January 2019), Cambridgeshire >Melbourn >District 09 >image 10 of 27; TNA, RG 13/1296/9. 1911 England Census, Surrey, Penge, ED 2, schedule 138, Maude Emily Casbon in household of Adele Maude Everest; Ancestry (https://search.ancestry.com/search/db.aspx?dbid=2352 : accessed 20 March 201), Surrey >Penge >02 >image 276 of 809; TNA, RG 14/3406. “Search the GRO Online Index,” deaths, Maud Emily Casbon, D[ec] qtr, 1911, Croydon, vol. 2A/408. “Search the GRO Online Index,” births, Hilda Mary Casbon, D[ec] qtr, 1887, Royston, vol. 3A/466. 1911 England Census, Cambridgeshire, Fowlmere, ED 5, schedule 26, Hilda Casbon in household of Sarah Casbon; Ancestry (https://search.ancestry.com/search/db.aspx?dbid=2352 : accessed 28 January 2019), Hertfordshire >Fowlmere >05 >image 52 of 265; TNA, RG 14/7557. England, birth certificate (PDF copy) for George Casbon, born 11 Jun 1914; registered June quarter, Croydon district 2A/618, West Croydon Sub-district, Surrey; General Register Office, Southport. Tessa Arlen, “The Redoubtable Edwardian Housemaid and a Life of Service,” Tessa Arlen Mysteries from the early 1900s (http://www.tessaarlen.com/redoubtable-housmaid-life-belowstairs/ : accessed 28 January 2019). “Search the GRO Online Index,” deaths, Hilda Casbon, J[un] qtr, 1921, Croydon, vol. 2A/312. “Search the GRO Online Index,” births, Elsie Lydia Casbon, S[ep] qtr, 1890, Royston, vol. 3A/490. 1911 England Census, Cambridgeshire,Cambridge, ED 7, schedule 135, 160-1 East Rd, Elsie Lydia Caslon in household of George W Sheet; Ancestry (https://search.ancestry.com/search/db.aspx?dbid=2352 : accessed 20 March 2018), Cambridgeshire >Cambridge >St Andrew the Less >07 >image 274 of 313; TNA, RG 14/9107. “Search the GRO Online Index,” deaths, Elsie Casbon, J[un] qtr, 1919, Kensington, vol. 1A/217. My last post dealt with Elizabeth Casbon, a lady’s maid. Today we’ll look at a male servant who placed a newspaper advertisement similar to those placed by Elizabeth. In this ad, “W. Casbon” is seeking a position as first footman. He gives his age and height. He says he has a “good character” (reference from current or previous employers). His address is in the oddly-named village of Ashby-de-la-Zouch in Leicestershire. This is presumably where he is currently employed. Who was W. Casbon? His stated age gives us a birth year of about 1860. Unless he has greatly over- or under-exaggerated his age, the only candidate I can find is William Casbon, born 1860 at Meldreth, Cambridgeshire. William was the son of William (1835–1896) and Sarah (West, ~1823–1905) Casbon. I’ve written about William previously, so I won’t repeat the details. However, I will say that he led an interesting life. The 1871 census lists eleven-year-old William as a “Scholar.” In 1881 we find him working as a “Railway Signalman” in Derbyshire. He later went on to become a baker, then the manager of a Golf Club, and finally, the Superintendent of the Refreshment Department of the House of Lords in London. Ashby-de-la-Zouch is only about fourteen miles away from Breadsall, Derbyshire, where William was listed in the 1881 census. There were probably only a few households that could afford a footman, but I haven’t identified the specific home where he worked. What is a footman? The word has an interesting history. It used to refer to a servant who ran alongside his master’s carriage, or ran ahead to announce his arrival. The meaning later came to refer to a male household servant with various duties, including opening and closing doors, serving meals and carrying items to heavy for the female servants. a footman in the old sense, running alongside or ahead of his master’s entourage. In the hierarchy of servants, footmen were on a lower rung than the butler, who was generally the highest-ranking male servant. Very wealthy households might have several footmen, numbered in order of their relative standing in the household (i.e., “first footman,” “second footman,” etc.). In houses without a butler, the first footman would perform the butler’s duties. An extended list of a footman’s duties would be too long to write here, but would include cleaning boots and silver, answering the door to visitors, serving at meals, lighting lamps, lighting fires, going out with a carriage, and serving as a valet to the younger gentlemen in a family. Footmen often wore livery – a special uniform. Their livery might include knee breeches and silk stockings, and in some households, powdered wigs. The household usually provided two suits of livery per year. Footmen were often selected for their height and looks. Hence, the advertisements above include the man’s height. William Casbon seems to have been at an advantage with his height of 6 feet, 2 ½ inches! Footmen also tended to be fairly young, as can also be seen in the advertisement. When William placed the advertisement in 1884, he was probably working as a second or third footman, and looking to move up the ladder to a higher position. He obviously did not make a career of domestic service. However, his experiences as a footman probably gave him valuable experience that helped prepare him for his eventual position with the House of Lords. In an era where class distinctions were pronounced, he made significant strides. “Want Places,” The (London) Morning Post, 5 Mar 1884, p. 8, cols. 6–7; online image, British Newspaper Archive (https://www.britishnewspaperarchive.co.uk : accessed 24 September 2016). England, “Search the GRO Online Index,” HM Passport Office (https://www.gro.gov.uk/gro/content/certificates/indexes_search.asp : accessed 25 January 2019), search on “Casbon” “William” “1860,” Casbon, William, mother’s name West, S[ep] qtr, Royston, vol. 3A/205. 1871 England census, Cambridgeshire, Meldreth, enumeration district 15, p. 18, schedule 105, William Casbon (age 10); imaged as “1871 England Census,” Ancestry (https://search.ancestry.com/search/db.aspx?dbid=7619 : accessed 25 January 2019), Cambridgeshire >Meldreth >District 15 >image 19 of 32; citing The National Archives, RG 10/1363/23. 1881 England census, Derbyshire, Breadsall, enumeration district 11, p. 2, schedule 9, William Caskan; imaged as “1881 England Census,” Ancestry (https://search.ancestry.com/search/db.aspx?dbid=7572 : accessed 25 January 2019), Derbyshire >Breadsall >District 11 >image 3 of 24; citing The National Archives, RG 11/3393/67. 1891 England census, London, St George Hanover Square, enumeration district 14, p. 20, schedule 56, William Caston; imaged as “1891 England Census,” Ancestry (https://search.ancestry.com/search/db.aspx?dbid=6598 : accessed 25 January 2019), London, St George Hanover Square >Mayfair >District 14 >image 13 of 42; citing The National Archives, RG 12/69/76. 1901 England census, Hertfordshire, Chorleywood, enumeration district 11, p. 19, Wm. Chaban; imaged as “1901 England Census,” Ancestry (https://search.ancestry.com/search/db.aspx?dbid=7814 : accessed 25 January 2019), Hertfordshire >Chorleywood >District 11 >image 20 of 24; citing The National Archives, RG 13/1322/49. Jon Casbon, “A Casbon in Parliament?” Our Casbon Journey, 9 Mar 2017 (https://casbonjourney.wordpress.com/2017/03/09/a-casbon-in-parliament/ : accessed 25 January 2019). “Footman,” Etymology Online (https://www.etymonline.com/word/footman#etymonline_v_33280 : accessed 20 January 2019). “Footman,” Wikipedia (https://en.wikipedia.org/wiki/Footman : accessed 20 January 2019), rev. 1 Oct 18, 02:32. 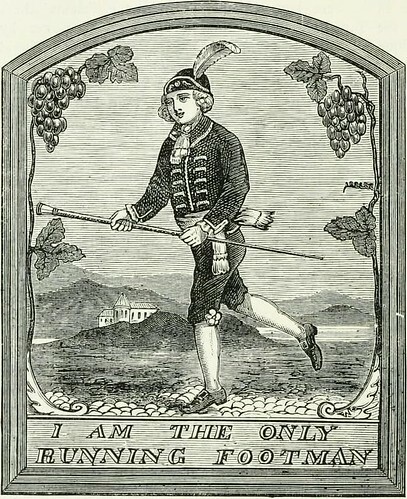 “I am the Running Footman,” engraving in Edward Walford, Old and New London: a Narraitve of Its History, Its People, and Its Places (London: Cassell, Petter & Galpin, 1873), vol. 4, p. 330; online image, Internet Archive (https://archive.org/details/oldnewlondonnarr04thor : accessed 22 January 2019). The Servants Practical Guide: a Handbook of Duties and Rules (London: Frederick Warne & Co., 1880), pp. 161-2; online image, Internet Archive (https://archive.org/details/b21528147 : accessed 22 January 2019). “Secrets of the Manor House: Recap and Review,” 22 Jan 2012, blog post, Jane Austen’s World (https://janeaustensworld.wordpress.com/2012/01/22/secrets-of-the-manor-house-recap-and-review/ : accessed 22 January 2019). 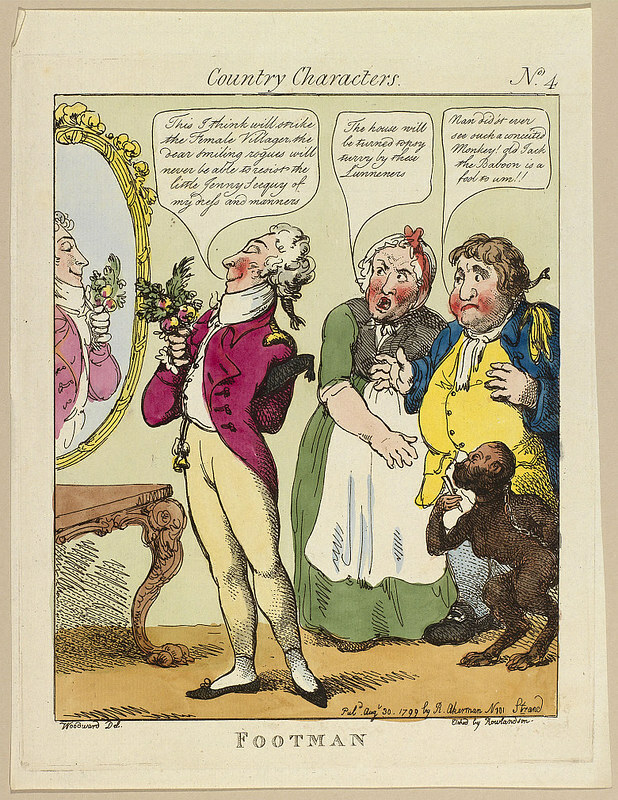 Royal Trust Collection (https://www.rct.uk/collection/810523/country-characters-no-4-footman : accessed 22 January 2019). The title for today’s post comes from the July 22, 1887 London Morning Post. 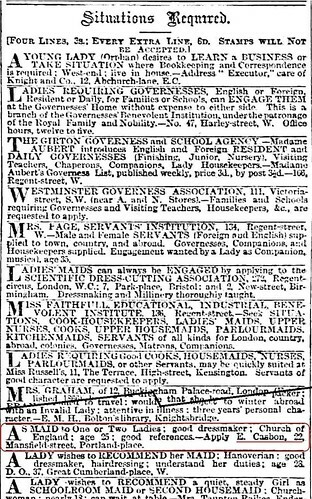 Detail of “Situations Required” classified advertisements, The (London) Morning Post, July 22, 1887. We see that “E Casbon” is seeking a position as a “Maid to One or Two Ladies.” She is twenty-five years old, has experience as a dressmaker, belongs to the Church of England, and has “good references.” She is living at 22 Mansfield Street, Portland Place, London. Who was E Casbon? Her age tells that she was born in 1861 or 1862. There is only one woman with that name who was born in that timeframe: Elizabeth, daughter of John (1832–1885) and Rebecca (Speechly, ~1823–1886) Casbon of Peterborough. We’ve met her father, John, before. He was in the third generation of gardeners who eventually settled in Peterborough. John suffered through bankruptcy proceedings in 1870-71, but was eventually able to recover financially. Elizabeth was one of John and Rebecca’s five children who survived into adulthood. Little information is available about her life. We find her in the 1881 census, either living with or visiting her older brother Thomas in Peterborough. We see that Elizabeth is unmarried, nineteen years old, and employed as a dressmaker. Dressmaking was a very common occupation for women at the time. It’s likely that Elizabeth had completed a two-year apprenticeship. She might have worked from home or worked in a shop. She probably used a sewing machine, but would have had to do much of the work by hand. Dressmakers could make a decent living, but often faced long hours and difficult working conditions. 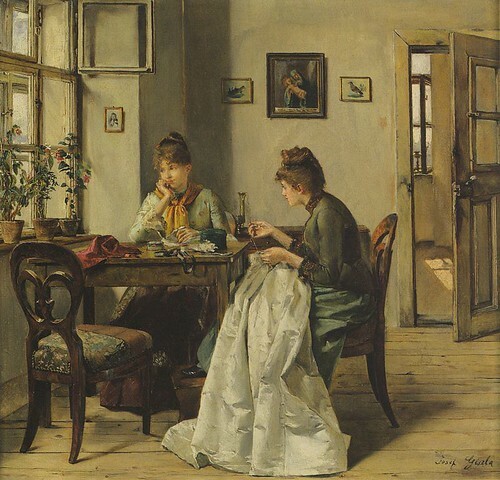 For more information about dressmaking in Victorian England, I refer you to an excellent blog post, “D is for Dressmaker,” by Amanda Wilkinson. Despite my best efforts, I haven’t been able to find Elizabeth in the 1891 and 1901 England censuses. That’s where the “Situations Required” ad helps out. We know from the advertisement that she had been working as a servant, probably a lady’s maid, at the house on Mansfield Street. She must have started her employment there some time after the 1881 census was taken. What can we find out about the residence on Mansfield Street? The 1881 census helps us out. It turns out that 22 Mansfield Street was occupied by a wealthy gentleman named Charles J.T. Hambro, whose father founded one of the United Kingdom’s largest investment banks. The family’s main home was at Milton Abbey, in Dorset, so the Mansfield Street residence would have been their London home. Charles J.T. Hambro held the offices of Deputy Lieutenant and Justice of the Peace for Dorset, and was a Member of Parliament from 1868 to 1874 and again from 1886 until his death in 1891. When the 1881 census was taken, the household on Mansfield Street was occupied by Charles Hambro, his wife Susan, daughter Agneta, and eleven servants, consisting of a cook, two kitchen maids, two housemaids, two lady’s maids, one butler, two footmen and one page. That is an impressive number of servants, and indicates the Hambros’ significant wealth and position in society. How is it that Elizabeth left her employment as a dressmaker in Peterborough to become a lady’s maid in London? That is unknown. Elizabeth must have thought there were better opportunities for her in domestic service compared to her previous occupation, and London certainly offered a greater number of potential employers. She might have started in a lower maid’s position before being promoted to the position of lady’s maid. Being new to the job, she probably served one of the daughters of the house. Her dressmaking experience would have been a great asset, as it was considered a prerequisite for lady’s maid duties. What were those duties? Anyone who has watched Downton Abbey will have some idea of what was involved, thanks to the trials and tribulations of Anna Bates, Lady Mary’s long-suffering personal maid. In the hierarchy of female servants, the lady’s maid was the second highest in rank, after the housekeeper. Her position was unique in that she had a much closer relationship to her mistress than the other servants. A partial list of her duties is given in The Duties of Servants (1890). To bring up the hot-water for her mistress in the morning and at various times of the day as required. To bring her an early cup of tea. To prepare her things for dressing. To assist her in dressing. To put her room in order after dressing. To put out her things for walking, riding, and driving, both in the morning and afternoon. To assist her in taking off her out-door attire. To put in readiness all that her mistress may require for dressing in the evening. To assist her to dress for dinner. To put everything in order in her mistress’s room before leaving it. To sit up for her, and to assist her to undress on her return, and to carefully put away her jewels and everything connected with her toilette. To keep her mistress’s wardrobe in thorough repair, and to do all the dressmaking and millinery required of her. To wash the lace and fine linen of her mistress. She was essentially at the beck and call of her mistress, in order to look after her every need. In turn, lady’s maids received perks not available to other servants. They were likely to receive their mistresses’ cast-off clothing, which they could alter to fit themselves or sell to others. They might receive commissions from tradespeople who did business with their mistresses. They had opportunities to travel, when their mistresses went abroad or were guests in other households. This tells us quite a bit about Elizabeth’s responsibilities after coming to London, and perhaps something about her character as well. She was probably somewhat better educated than the other female servants and was able to conduct herself in a manner fitting of the position. The fact that she had “good references” tells us that she performed her duties satisfactorily. We don’t know why she left her employment with the Hambro family in 1887, although it seems to have been under favorable circumstances. Perhaps one of the daughters was no longer living at home, or the family was downsizing the London home and no longer needed as many servants. We do know that Elizabeth was successful at finding new employment, given that she placed this advertisement in 1890. The fact that she had “2 ½ years’ good character” tells us that she must have been hired soon after the previous (1887) advertisement was placed. Note also that she was now living in Millfield, Peterborough, her home town. This suggests that her employment had already ended. We don’t know what happened for the next seventeen years of her life, since she doesn’t seem to appear in the 1891 and 1901 censuses. The next record I have of Elizabeth is for her marriage in 1907 to William Buxton, a widower from Doncaster. As of 1926, William and Elizabeth were still living in Doncaster. I haven’t been able to pin down their death dates. Elizabeth’s story, though incomplete, is interesting because it reflects the experiences of many women in late Victorian England. As dressmaker and domestic servant, she worked in two of the most common occupations (along with factory work) of her era. Though typical, it probably wasn’t an easy life. As with so many of our family stories, I wish I could know more. “Situations Wanted,” The (London, England) Morning Post, 22 Jul 1887, p. 7, col. 8; online image, British Newspaper Archive (https://www.britishnewspaperarchive.co.uk/ : accessed 4 September 2017). 1871 England Census, Northamptonshire, Peterborough, district 33, p. 5, schedule 28, Elizabeth Casbon in household of Thomas Casbon ; imaged as “1881 England Census,” Ancestry (https://search.ancestry.com/search/db.aspx?dbid=7572 : accessed 17 January 2019), Northamptonshire >Peterborough >District 33 >image 7 of 23; citing The National Archives, RG 11/1595. Sally Mitchell, Daily Life in Victorian England (Westport, Connecticut: The Greenwood Press, 1996), p. 62. “Charles J.T. Hambro,” Wikipedia (https://en.wikipedia.org/wiki/Charles_J._T._Hambro : accessed 18 January 2019), rev. 19 Oct 18, 08:28. 1881 England Census, London, Marylebone, Cavendish Square. District 8, p. 22, schedule 68, Charles Hambro; imaged as “1881 England Census,” Ancestry (https://search.ancestry.com/search/db.aspx?dbid=7572 : accessed 17 January 2019), London >Marylebone >Cavendish Square > District 8 >image 23 of 47; citing The National Archives, RG 11/140/57. Isabella M Beeton, Mrs. Beeton’s Book of Household Management: a Guide to Cookery in All Branches, “new” ed., (London: Ward, Lock & Co., 1907), p. 1773; online image, Internet Archive (https://archive.org/details/mrsbeetonshouse00beetuoft : accessed 14 January 2019). Pamela Horn, The Rise and Fall of the Victorian Servant (New York: St. Martin’s Press, 1975), p. 55. The Duties of Servants: a Practical Guide to the Routine of Domestic Service (London: Frederick Warne & Co., 1890), pp. 99–100; online image, Internet Archive (https://archive.org/details/b2152810x : accessed 18 January 2019). The Family Manual and Servants’ Guide, 9th ed. (London: S.D. Ewins, 1859), p. 97; online image, Google Books (https://books.google.com/books?id=gkACAAAAQAAJ&source=gbs_navlinks_s : accessed 14 January 2019). Lucy Lethbridge, Servants: A Downstairs HIstory of Britain from the Nineteenth Century to Modern Times (New York: W.W. Norton & Co., 2013), p. 78. Horn, The Rise and Fall of the Victorian Servant, p. 57. “Want Places,” The (London, England) Morning Post, 4 Jun 1890, p. 11, col. 3; online image, British Newspaper Archive (https://www.britishnewspaperarchive.co.uk/ : accessed 4 September 2017). Church of England, Peterborough (Northamptonshire), St Paul’s, Register of Marriages, vol. 2 (1905–1921), p. 30, no. 60, William Buxton & Elizabeth Casbon, 19 May 1907; imaged as “Northamptonshire, England, Church of England Marriages, 1754-1912,” Ancestry (https://search.ancestry.com/search/db.aspx?dbid=9199 : accessed 18 January 2019), Peterborough, St Paul >Parish Registers >1905-1912 >image 18 of 54; citing Northamptonshire Record Office; Northampton. Yorkshire (West Riding), Autumn Register 1926, Doncaster Parliamentary Division, Polling District L, St. James Ward, p. 31, nos. 1750-1, 6 Roberts Rd., William & Elizabeth Buxton; imaged as “West Yorkshire, England, Electoral Registers, 1840-1962,” Ancestry (https://search.ancestry.com/search/db.aspx?dbid=3057 : accessed 18 January 2019), Doncaster >1926 >image 666 of 773; citing West Yorkshire Archive Service, Leeds. Mitchell, Daily Life in Victorian England, p. 62.